So hopefully by now, you've picked up or ordered your calligraphy supplies and you're eagerly awaiting their arrival. Well, in the meantime, there's something really important you need to know about. And that, my friends, is fauxligraphy. What makes calligraphy so pretty is the mixture of thick and thin up and downstrokes. In calligraphy, the downstrokes are thick and the upstrokes are thin. This creates the pretty range you'll come to learn and love! The arrows in this photo guide you through finding the upstrokes and the downstrokes in a letter. 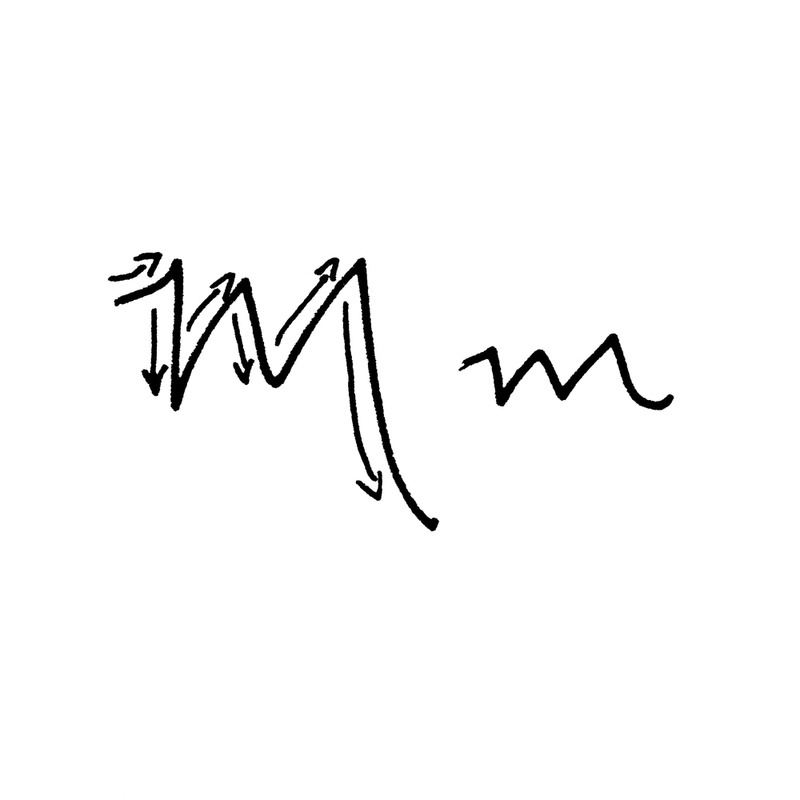 In this first illustration of a capital 'M' and lowercase 'm' I've used arrows to show you the upstrokes and downstrokes I used to create the letters. I love using Sakura Gelly Roll pens when I'm playing around with fauxligraphy. First, because they're super cheap and second, because the gel flows really easily from the pen! They're not great for tiny details, but they're perfect for practicing fauxligraphy and one of my favorite mediums to use when I address envelopes to family and friends! If you don't happen to have a gel pen on hand, you can also use any sort of sharpie pen or maker for playing around. Hand lettered M's with thickened downstrokes give the appearance of being written in calligraphy. So once you've identified the upstrokes and downstrokes in a letter, the next step is to darken the down strokes by going over them again and broadening those lines a little bit. This gives the letters the look of calligraphy without ever touching a nib or ink! Now, at this point, you might be pretty excited about the possibilities of things you can create - great! That's exactly where I want you to be! Hand lettering can be just as pretty as calligraphy with and without the thick downstrokes and the things you can do with this skill are truly endless. The difference is honestly the medium with which they are created and sometimes a nib and ink (even though I love them) just don't cut it. So my homework for you this post, is to play around with making your best handwriting look like calligraphy! And if you're not quite in love with your own handwriting, print off one of your favorite cursive fonts and practice thickening the downstrokes and creating fauxligraphy! Happy Lettering! You've spent hours browsing Pinterest, you're obsessed with beautiful images of calligraphy and eager to learn, but you have no idea where to begin. Don't worry, I've been there too!